Augustus Leopold Egg was born the youngest of four siblings to Joseph Egg and Ann Egg on 2nd May 1816 in London. His father belonged to a wealthy family of gun manufacturers. His initial coaching took place at Hall Place, Kent(1828-1833). Later on, in 1834; influenced by Francis Chantry, a renowned sculptor, he joined the Henry Sass Academy in Bloomberg, London. There he got acquainted with the basics of drawing. It was in 1836 at the age of 20, that he joined the Royal Academy Schools. 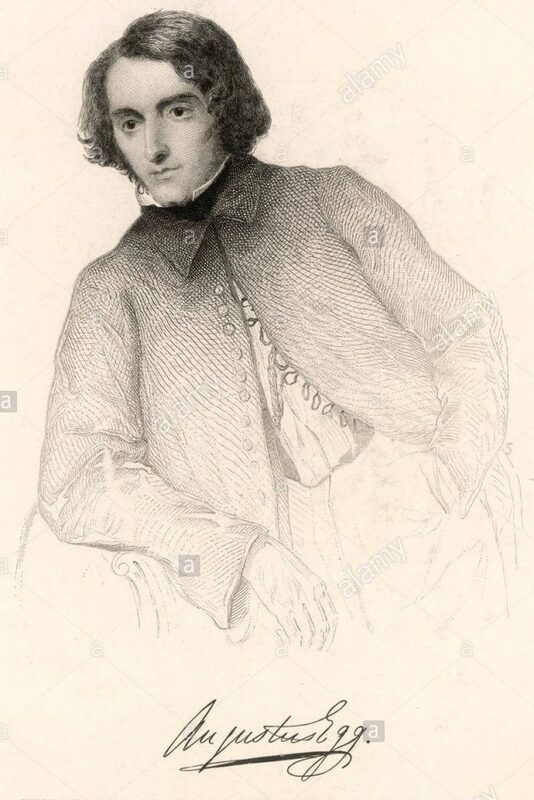 The next year, Egg, along with Richard Dadd, William Firth, Henry O’ Neil, and John Phillip, founded The Clique, a society of promising young sketch artists.The same year, Egg made his debut at The Society of British Artists in Suffolk Street. Reflecting a strong Hogarthian influence in his works, the following years saw him participating at The British Institute and also the Royal Academy (1838). In 1839 he exhibited his pieces at the annual exhibitions in Birmingham and Liverpool and in 1840, at Manchester. His initial paintings, although competent proved to be commonplace and didn’t find any critical acclaim. Egg successfully tried his hands at painting comic scenes from Shakespeare, Byron, and Walter Scott. Although his style bore a resemblance to that of Charles Leslie, they exhibited vivid storytelling abilities, such as the scenes from Shakespeare’s ‘Henry IV’ and Sir Walter Scott’s,’The Monastery’. 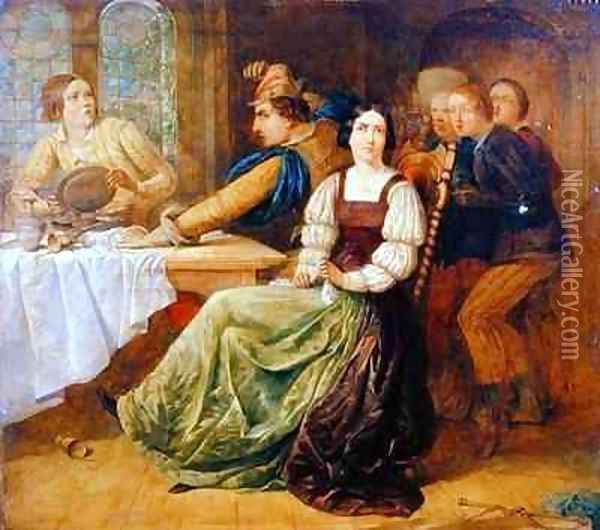 Depicting the complex relationship between sexes, are his paintings such as Cromwell discovering his chaplain, Jeremiah White, Making love to his daughter Frances and Buckingham Rebuffed.A display of a variety of human characteristics, such as human pride and casual sexual desires could be found in his paintings titled, L’amante and a scene from ‘The devil on two sticks’. Shakespeare’s,’The taming of the shrew’, found a special place in Egg’s works for, as many as 24 pieces of his art were based on episodes from the play. Egg’s rejection from the Royal Academy resulted in him painting a larger and serious historical piece titled, ‘ Queen Elizabeth discovers she is no longer young‘. His efforts paid off and the painting received rave reviews from art critics for his knowledge and dramatic presentation of the Victorian era. 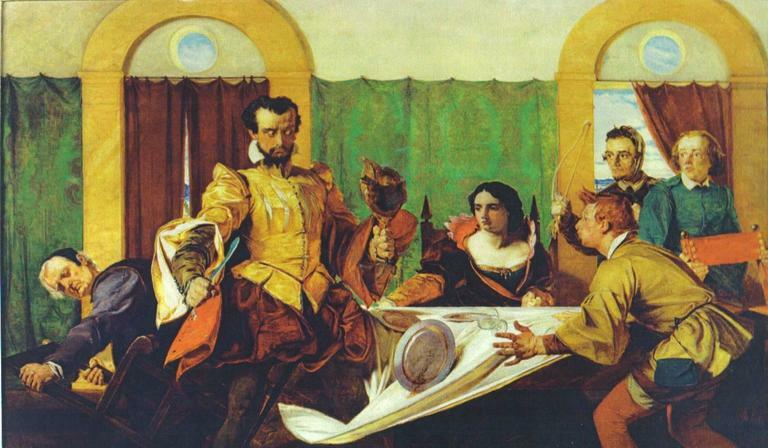 Paintings such as Launce’s Substitute for Proteus’s Dog(1849); Queen Henrietta Maria in distress, Peter the Great sees Catherine his future empress for the first time(1850) and Pepy’s introduction to Nell Gwynne(1851), all portray Egg’s inclination towards dramatic and humorous themes and the man-woman relationship. Known for his portrayal of human character and morals, Egg’s famous paintings are in the form of a diptych ànd a triptych. The diptych titled,’ The life and death of Buckingham were painted between 1853 to 1855 and won him the Liverpool prize. The twin paintings were displayed in a single outer frame and portrayed the rise and tragic demise of George Villiers, the second Duke of Buckingham. His next, a triptych, was released in 1859, named ‘The past and the present’. This series of three pictures displays the difficult and controversial societal norms of the Victorian era. The first scene shows the husband holding a letter suggestive of his wife’s infidelity. 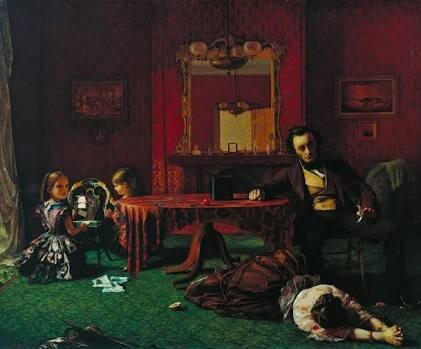 The two young girls are in the background, playing the house of cards which is symbolic of the family breaking up. The door of the room is open, indicating the impending ouster of the wife from the house. The second and the third picture tells incidents of the same time, but years later. The father has recently died and the children are orphaned. The mother has taken refuge under the Adelphi arches with a baby in her arms- the result of her infidelity. The triptych found special mention among the critics as being painful, realistic and portrayed difficult social issues of the Victorian era. Although highly acclaimed and appreciated, these paintings found no buyers during Egg’s lifetime. Then on Egg kept painting pieces depicting history, theatre and conflicting social issues, such as the two paintings from The History of Henry Esmond (1857) and The Night before Naseby(1858). 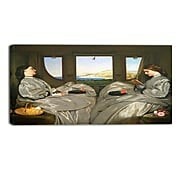 Another of his masterpieces, which is highly discussed is the 1862 ‘The Traveling Companions’ showing two women in a train carriage. The women are in their extravagant forms but cramped in the carriage. The view outside the window shows the vast expanse of the French Rivera, a journey often undertaken by Egg himself. The picture echoes the modern day living where people led opulent lives but loved to remain in their small, closed worlds. An aspect of Egg’s personality was his inclination and love for theatre. His circle of friends included Charles Dickens and Wilkie Collins. He took up roles of actor and costume designer in their amateur theatricals. Avidly interested in acting, Egg appeared in over a dozen of Dicken’s plays, although a majority of them were for charity causes. His role as a lead artist in Collin”s play,’ The Frozen Deep’ also starred Dickens. Incidentally, he also painted Charles Dickens as the character of Sir Charles from the play,’ Used up’. He was elected a member of The Garrick Club in 1849 which was formed mainly by writers and theatre artists. A thorough gentleman, Egg was referred to by his contemporaries as a very genial, helpful, conscientious, dedicated and fair-minded person. He was very helpful to the younger artists which are evidenced in his approach towards painter William Hollman Hunt. He helped Hunt to get his paintings sold to important collectors and himself bought a couple of them. With the aim to provide financial support to struggling artists and writers; Egg, along with Dickens started the Guild of Literature and Art. To raise funds for the Guild, he even acted in the lead role in ‘Not so bad as we seem’ and donated the proceeds to it. Egg always took an active role in organizing art exhibition and supervised the installations of the modern British paintings at the Manchester Art Treasures exhibition. It was after 1840 when he had moved to Soho that Egg’s repertoire took a turn for the better. In 1848, Egg changed residences to Ivy Cottage, Bayswater, London and opted for Associateship in the Royal Academy, which was unfortunately rejected. The same year, he was elected to the Royal Academy as an associate member. Subsequent annual exhibitions of the RA were host to Egg’s paintings dabbling in history, literature and intergender relationships. In the year 1860, he married Esther Mary Brown and also became a member of the Royal Academy. Always suffering from respiratory illness, Egg spent his later life in the warmer climate of Southern Europe and The Mediterranean. He died of severe asthma in Algiers on 26th March 1863 and was laid to rest in the new cemetery there.